MindGrammar Pro 2.2 is a fully integrated dynamic grammar checker for Adobe InDesign. Currently it is available for InDesign CS4-CC 2019. MindGrammar Pro contains all the features of MindGrammar – a simple, yet powerful, grammar checker for the English language – in addition to Preflight rules to quickly identify grammar errors. Take advantage of Live Preflight and eliminate unnecessary grammar errors in your document. With the release of version 2.0 you can now create Preflight rules for each Grammar category. There are currently 33 categories of grammar errors that are checked. Here you can see the preflight panel with the MindGrammar Pro profile applied. Below is a video demonstration of MindGrammar Pro 1.0. 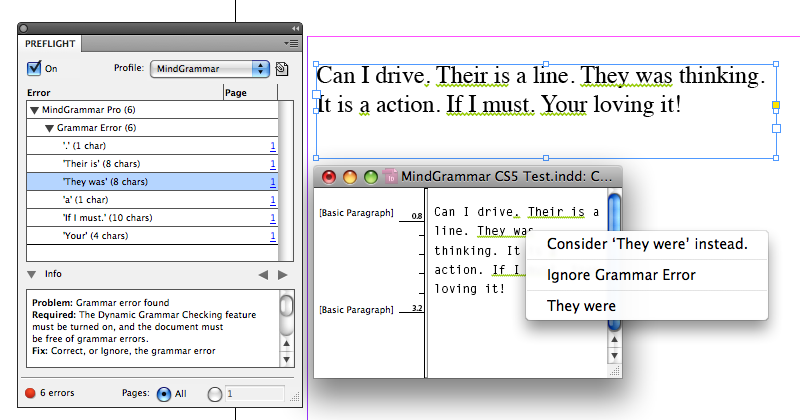 MindGrammar Pro also has the ability to generate full grammar error reports for your InDesign documents. Here you can see a portion of the MindGrammar Pro preflight report from the sample text in the above movie.